Listen and watch sessions from the 2018 Calvary Chapel Worship Leaders Conference. 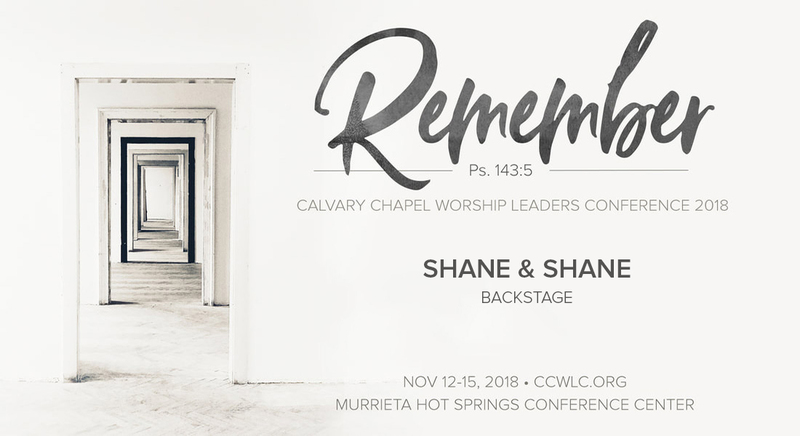 Watch Jarrett Petero and Scott Cunningham interview Shane from Shane & Shane at the 2018 Calvary Chapel Worship Leaders Conference. Watch a workshop from Wildwood at the 2018 Calvary Chapel Worship Leaders Conference. Watch Jarrett Petero interview Bob Kauflin at the 2018 Calvary Chapel Worship Leaders Conference. Jarrett Petero interviews Thomas Terry at the 2018 Calvary Chapel Worship Leaders Conference. Watch Pete Nelson at the 2018 Calvary Chapel Worship Leaders Conference. Watch Thomas Terry's workshop from the 2018 Calvary Chapel Worship Leaders Conference. Watch Bob Kauflin at the 2018 Calvary Chapel Worship Leaders Conference. Watch the Question & Answer Panel from the Calvary Chapel Worship Leaders Conference. Watch Bob Kauflin's workshop from the 2018 Calvary Chapel Worship Leaders Conference.